Ted Talbot has obtained permission from the Railway Magazine for it to appear here. It was published in the Railway Magazine in November 2012. It appears to show a scene in Crewe Works where a crane seems to have collapsed or the loco was not secured correctly when being lifted. Obviously two cranes would be required to lift a locomotive. 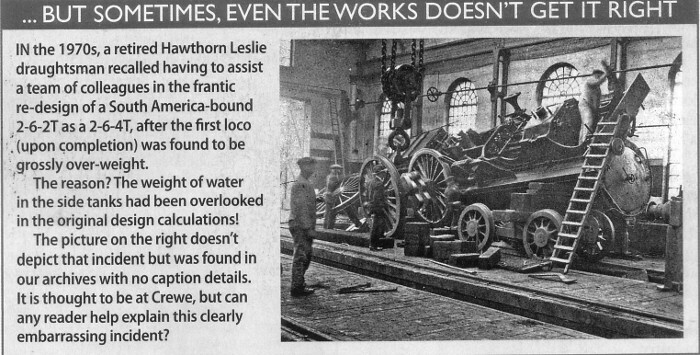 Presumably the object of the lift was to lower the engine onto its driving axles. I am guessing that the front crane attempted the lift with a chain around the front buffers, and the right-hand buffer has sheared off! The loco then rolled onto its back, the rear chain attachment at the drawbar simply revolving. If the engine had been lifted by the front buffers and the near one had sheared off, surely the engine would have rolled toward the camera. The usual way of lifting engines in the works was by two hooks with long shanks, suspended from a single ring. The hooks went under the buffer beam and apparently outside the frames so it should have been impossible for them to shift. It appears that the far hook has failed, causing the engine to turn onto its left side. With the buffer beam sloping to that side the near hook has slipped along the bottom of the buffer beam, catching the engine's right-hand buffer and shearing it off. Falling more or less sideways onto the wheels, the engine then toppled to the far side. It looks as though the wreck has been stabilized with timber and jacks.